As a global population, water consumption is higher now than it has ever been. The current rate of consumption far exceeds the rate at which water can naturally replenish. This results in water shortages for many municipalities around the world. Creating sustainable cities is just one way to reduce overall consumption of resources. However, sustainable cities are not a new concept. Copenhagen began projects focusing on water quality in 1972. Groundwater mapping projects started in 1999 and by 2002, plans for sustainable water practices were well underway. Copenhagen continues to be a leader in sustainable urbanization due to its long-term goals that impact current and future generations. What Makes a Water Sustainable City? Arcadis, a sustainable design and consultancy company, released a 2016 report that ranked cities on their water sustainability. It examines how a city is utilizing its water assets for the greatest long term advantage. The ranking system uses three sub-indexes to determine water sustainability: resiliency, efficiency, and quality. Resiliency – Water resilient cities are prepared to protect citizens against natural disasters that can cause unforeseen water shortages. This sub-index looks at disaster preparedness plans for flooding and drought. It also evaluates factors that ensure water service remains uninterrupted during disasters. This includes current water stress, amount of green space available, and the balance of water resources. Efficiency – Efficient and controlled water management is vital to preserve water resources for future generations. In many cities, water infrastructure is outdated and suffers from pipe leakage and service interruptions. The efficiency sub-index looks at how cities utilize new water management technologies, such as Advanced Metering Infrastructure (AMI), waste water reuse, and sanitation. Quality – Historically, cities in the developed world have only become prosperous after addressing water quality and sanitation issues. Cities in developing nations will have to do the same in order to become prosperous, sustainable urban centers. Cities often have the highest performance in the water quality sub-index because high quality water is recognized as critical in improving quality of life. 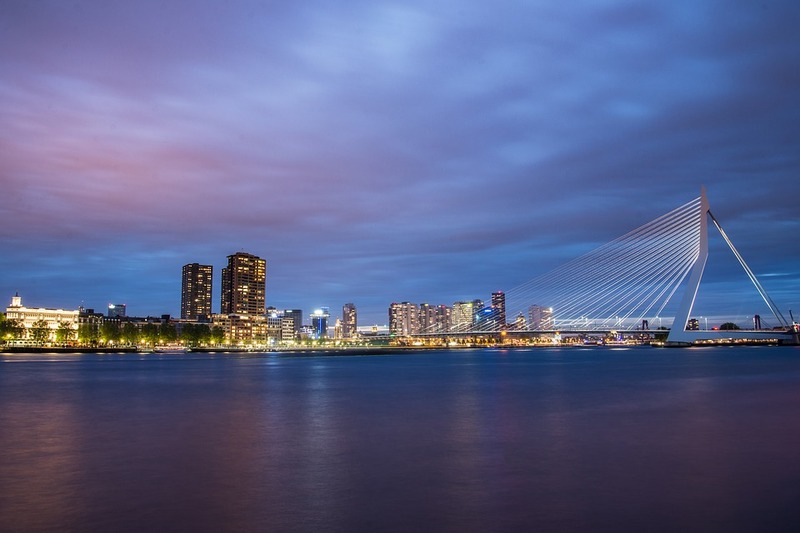 Rotterdam is the highest ranking city in the index. It has the best balance among the three indexes. In many ways, it is a leading global city in both urban resiliency and sustainability. Rotterdam has implemented a number of city agencies and official positions dedicated to improving resiliency. A Chief Resilience Officer and the Connecting Delta Cities program are just a few examples. The city also heavily invested in its reservoir catchment system, and utilizes unique water storage systems under the central station and Museum Park Garage. Sydney is iconic for its coastline, maritime activities and famous architecture along the shore, including the Sydney Opera House. Sydney has committed to diversifying its water portfolio with desalination projects and water resource management. Because the coastal city is susceptible to drought and other natural disasters, a local Chief Resiliency Officer has been put into place to ensure sustainable water supplies. The city also faces significant water stress, but they combat this with water reserves and an abundant amount of green space. New York may not have a reputation as the world’s cleanest city, but you might be surprised to find out that low levels of water pollution makes it one of the top leaders in water sustainability. Significant efforts have been made to improve water quality with pretreatment, source water control and reduction of nitrogen discharge. New York is ranked lower in the index due to high water consumption rates and the fact that the city does not reuse significant amounts of treated wastewater. It is sometimes a “feast or famine” with Dallas. It is susceptible to drought in dry years and flooding along the Trinity River in wet years. These two challenges create serious consequences for the city’s infrastructure. The city also faces increasing water demand as a result of increased population and urbanization. The city outranks other regional cities in the index due to use of surface water in area reservoirs and irrigation ordinances that have improved water conservation. Singapore is the top ranking Asian city in the Index and has made vast improvements over the past several decades to become a regional hub. The city has great water treatment, wastewater reuse and little waste caused by leaking infrastructure. However, Singapore’s geographical location creates susceptibility for flooding and a dependency on foreign freshwater sources. Up to 60% of Singapore’s water is imported from the Johor Strait, which borders Singapore and Malaysia, but falls under Malaysia’s jurisdiction. Singapore has made significant investments in projects to counter these challenges, and despite difficulties, the city still strives to increase sustainability. There is no perfect way to reach water sustainability for all of the world’s cities. Natural and manmade circumstances and challenges differ from city to city. Even these highly ranked cities are not completely prepared for all situations that may arise. As long as improvements are being made, cities can continue to become more sustainable and water conscious.